Candice was born with a liver disease, Biliary Atresia. With Biliary Atresia, there is destruction of the liver bile ducts inside and outside of the liver. This disease is very rare and impacts 1 in 12,000 infants born. Most children born with Biliary Atresia require a liver transplant by the age of 18. Candice is now on her journey toward a transplant. She plans to continue working as the USD #243 elementary school counselor for Lebo and Waverly for as long as she is able. Her time on the transplant list is unknown and how long she will be able to continue to work. 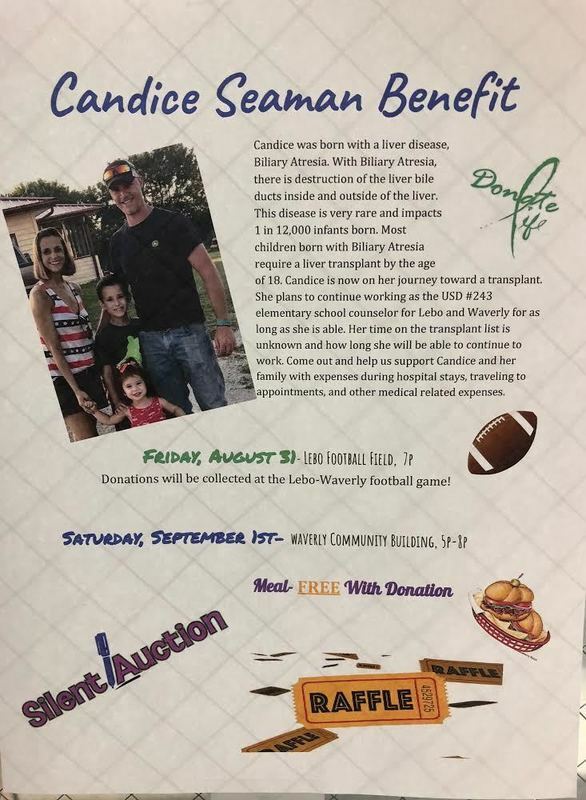 Come out and help us support Candice and her family with expenses during hospital stays, traveling to appointments, and other medical related expenses.